Sapota, popularly known in India as chiku, is native to tropical America Most probably to south Mexico or Central America. This plant is also grown for its Latex. Chicle and gutta parcha are extracted from its latex. These are used as a base material in chewing gum and in some other industrial products. Sapota, a crop of tropical region, needs warm (10-38 C) and humid (70 % relative humidity) climate where it flowers and fruits throughout the year. However, if taken to subtropics or to places of higher elevation like in Punjab and Haryana, it gives only one crop from summer flowering in April and May. Under moisture stress also, it produces one crop only. There are about 41 varieties spread all over the country. However, commercially sapota industry is based on a few varieties and in some areas it is only monoculture like Kalipatte in Gujarat and Maharashtra. Distribution of cultivars in India according to region is given in table 1. 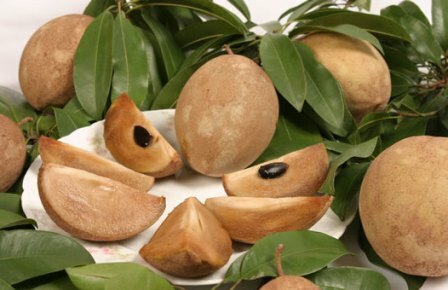 Sapota is propagated through seed, which has been the basis of its variability in India. But inarching, using Manilkara hexandra (called khirni or rayan in India) as a rootstock, is used in India. Air layering and softwood cuttings, using IBA (2,000ppm) treatment are also successful methods for sapota propagation. But plants which are raised through air layering or cuttings establish poorly and are vulnerable to wind damage. But still in Indian West Coast, air layering is more common and such plants also do not perform bad in shallow soils of that region. For air layering, 1-2years old, 45-60 cm, long juvenile matures shoots of pencil thickness with plenty of healthy dark green leaves are selected. On the base of such shoots, a ring of bark (2.5-3cm wide) is removed on which IBA+NNA (10,000ppm) each in lanolin paste is applied, covered with rooting media like sphagnum moss, vermiculite or garden soil and wrapped with plastic. The roots emerge in 1-3 months and then layers are slowly separated from the mother tree and established in nursery. They are planted in the next season. Sapota on rayan roots is the best combination in respect of plant vigour, productivity and longevity. Propagation of sapota by inarching using rayan as rootstock is the most accepted method of its commercial cultivation. Two years old potted rayan plants with pencil thickness are utilized and grafting is done in December-January. The plants are ready for separation in June –July of following year. This method is tedious, cumbersome and time consuming. Softwood grafting using rayan as rootstock gives 93% success in situ. It is an economically viable, faster, efficient and best technique. July-August is ideal time for it. Since sapota is a crop of warm and humid tropics, it can be planted in any season provided irrigation facilities are available. But it is beneficial to plant the grafts in beginning of the rainy season. In areas having heavy rainfall, it can be planted in September. In light soils pits of 60 cm x 60 cm x 60 cm size, whereas in heavy and gravely soils pits of 100 cm x 100 cm x 100 cm size are made in April May and exposed to sun for 15days. Top 30cm soil is mixed with equal quantity of well rotten compost or farmyard manure, 3kg super phosphate and 1.5kg muriate of potash are used for pit filling. To begin with all sides and bottom of the pit are dusted with 5% BHC dust and pits mixture is added to fill the pit and remaining vacant space is filled with remaining soil to height of 15cm above soil surface. Such pits are left to monsoon rains for settling and then planting is done at appropriate time. At the time of planting, a small hole sufficient to accommodate the ball of soil and roots of grafts is made in the centre of the pit and planted with scion in the direction of heavy wind to avoid damage to joint. After planting soil around the plant is gently and firmly pressed and stakes are provided to avoid sun heat. The plants are then lightly watered. Young plants should also be protected against sunscald by providing dry grass thatch on top ad three sides excepting the south-east for sunlight. Such well cared plants establish fast. Since sapota tree makes uniform all round growth, square system of planting is recommended. However, in lands with 5-15 % slope, contour planting is recommended. Depending on growth habit, sapota orchards are planted at 10x 10cm but being slower in growth, it takes longer period to occupy allotted space. Therefore, high density plantations having 5 m x 5 m spacing up to the age of 13 years are very remunerative. Thereafter yields begin to decline. A seedlings tree grows excellently giving a shape of an umbrella. However, plants raised through inarching require training for appropriate shape and frame work development. No definite system of training has been developed for sapota. Most trees are trained in central leader system. Owing to evergreen nature of the plant, any inadequacy in its nutrition leads to sub optimal yield. Deficiency of N leads to allowing of leaves from margin to mid rib. The P deficient plants have purplish flecks on lamina with rusty pigmentation all over and inadequacy of K is marked by development of chlorotic symptoms long leaf margins which become dark grey in advanced stage. Zinc deficiency is marked by small and erect leaves, short internodes and defoliation of terminals, whereas in calcareous soils iron deficiency causes general yellowing of leaves with premature shedding. A dose of 50kg farmyard manure, 1,000 g N, 500 g P2O5 and 500 g K2O/tree/ year is optimum. This quantity can be regulated on the basis of age of tree and status of nutrients in soil especially of P and K. under rainfed conditions, dose of N should be raised to1.5 kg/tree. Castor cake is beneficial for high quality fruits. The nutrient doses prevalent in the country are given in Table 2. Under rainfed condition, fertilizers should be applied before the onset of monsoon. However, under irrigated conditions it should be applied in 2 splits. Total quantity of organic manure and half of chemical fertilizers should be applied at the beginning of monsoon and remaining half in the post-monsoon period (September-October). Since 90% of active roots are distributed within drip up to a depth of 30cm, nutrients should be applied under tree canopy and mixed thoroughly in soil up to a depth of 15 cm. In Zinc and Iron deficiency, the requirement should be met through application of organic manures and spraying of ZnSO4 and FeSO4 (0.5 %). Depending on growth habit of sapota tree, a planting distance of 10 m x 10 m is ideal. Being a slow grower, it takes longer to occupy allotted space. Therefore, intercropping is imperative. Intercropping banana, papaya, pineapple and coca; French bean, tomato, brinjal, cabbage, cauliflower and cucurbits is recommended depending on climate and water resources. In established orchards, pre-monsoon and post –monsoon inter cultivation is recommended for better aeration and effective weed control. In young orchards, weed hazard is common. Use of 2 kg Bromacil + 2 kg Diuron/ha as pre-emergence spray is effective for a period of 10-12 months. 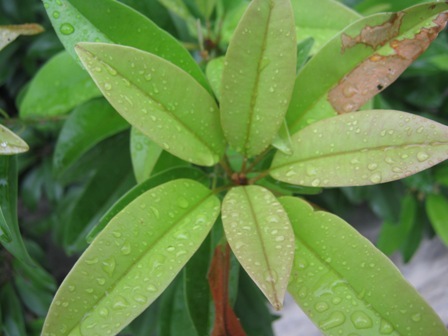 Mixed plantation with mango and guava should be avoided to reduce the problem of fruit fly. Habit of tree and its vegetative growth demand continuous supply of water. 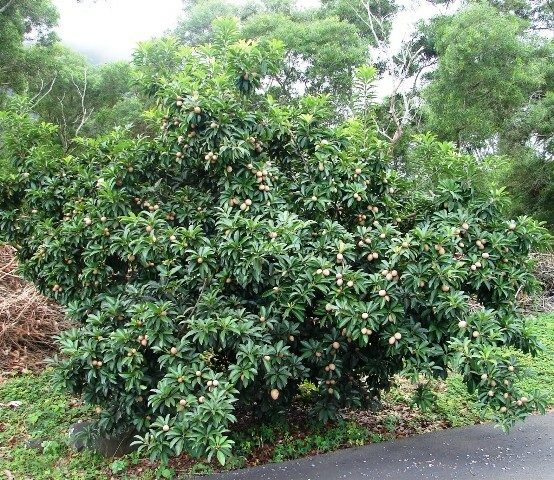 But sapota is grown both under irrigated and non–irrigated conditions. Sapota requires irrigation at 30 days in summer. Adoption of drip irrigation system is also beneficial, saving 40 % water with 70-75% higher net income. This system should be laid out with 2 drippers spaced 50 cm from tree during initial 2 years and 4 drippers at 1m from tree until 5 years of age. With dripper discharge rate of 4litres /hr, the system should be operated for 4hr during winter and 7hr during summer on alternate days. Under short supply of water, timing could be 3hr and 30minutes in winter and 5hr and 40mintues in summer. 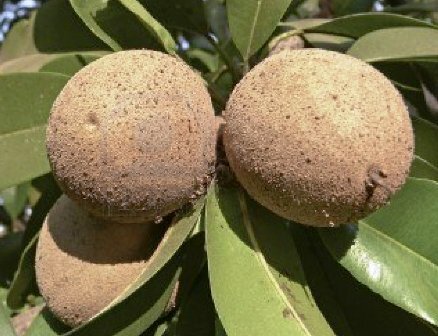 Sapota takes about 7-101/2 months from anthesis to maturity of fruits depending on variety and climate. Fruits follow double sigmoid pattern of growth. Properly developed fruits have high TSS and sugar, and reduced acidity, astringency, latex and vitamin C. Maturity is decided on the basis of ease with which brown scruff gets off the fruit surface and development of yellowish tinge intermixed wit corky brown color on the surface of the fruit. At this stage, practically no green tissue and milky latex are seen on fruits when scratched with nails. The fruits are hand picked or harvested with special harvester which has a round ring with a net bag fixed onto a long bamboo. Depending on management level, 15-20 tons fruits are harvested from a hectare. Since sapota is a climacteric fruit, it has to be ripening artificially. Fruits are highly perishable and they undergo rapid ripening changes within 5-7days during which the fruits become soft, sweet and develop excellent aroma with decline in tannins, latex sapotin, aldehydes and acidity. These changes are associated with increase in production of ethylene, rate of respiration, catalase, peroxidase and PME activities. These changes can be regulated through chemicals, temperature and storage gas composition. Harvested fruits should be cleaned of latex and scurf by washing in clean water to make them look attractive. Such fruits should be graded into big, medium and small sizes. Fruits should be tightly packed in cardboard boxes of 10 kg capacity with rice straw as padding material and with ethylene absorbents and transported quickly to wholesale markets. For extending shelf life and to avoid storage rots, fruits can be dipped in GA300 ppm + bavistin 1,000ppm solution at pre-packing stage. For uniform and rapid ripening ethephon (1,000ppm) can be utilized at 20`-25`C. Modified storage with 5-10 % (c/c) CO2 can be employed for long storage (21-25days). Refrigerated vans (12-23`C) should be utilized for long distance and export markets. Wilt or die back is common where sapota cultivation is being extended to traditionally rice growing regions. Due to anaerobic conditions in monsoon and post monsoon season in such areas wilt is of common appearance aggravated by Fusarium spp. This can be controlled by effective drainage facility before planting. The shape of fruit is related with number if seeds init which depend on conditions for pollination at anthesis. High temperature and rainfall during flowering cause oblongation of fruits. Therefore, cultivation of sapota in areas with extreme summer temperature should be avoided. Sometimes fruits do not develop into their normal shape but develop a depression or furrow towards the calyx end. This symptom usually appears immediately after heavy rainfall and is aggravated by high intensity of irrigation. Therefore over irrigation should be avoided. The fruits exposed to intense sunlight do not ripen uniformly, developing corkiness during winter. This is probably due to killing of hydrolyzing enzymes by alternation moisture accumulation and heating of fruit surface in winter. Thus its trees need to grow vigorously.